Sun., Jan. 21, 2018, 9:41 a.m.
WASHINGTON – Secretary of State Rex Tillerson is seeking British and French support for tough new penalties against Iran and preventing a U.S. withdrawal from the Iran nuclear deal. Tillerson on Sunday began a nearly weeklong trip to Europe, and a U.S. official said Iran was expected to dominate Tillerson’s talks in London and Paris, the first two stops. Tillerson left Washington as the government shutdown enters its second day. The State Department says he’s conducting foreign relations that are essential to national security. Britain and France are parties to the 2015 Iran deal that President Donald Trump has warned he will walk away from this spring unless fixes are made to his liking. The official said Tillerson’s intent is “to close the gaps” in the accord that gave Iran billions in sanctions relief in return for curbs on its nuclear program, and to explore more ways to counter Iranian behavior in Syria, Lebanon and Yemen. The official was not authorized to publicly discuss Tillerson’s plans before the trip, and spoke to reporters on condition of anonymity. Earlier this month, Trump pledged to stop waiving U.S. sanctions unless the Europeans agreed to strengthen its terms by consenting to a side deal that would effectively eliminate provisions that allow Iran to gradually resume some advanced atomic work. Trump also wants tighter restrictions on Iran’s ballistic missile program. Iran has rejected any renegotiation. Britain, France and the other European party to the accord, Germany, have expressed some willingness to work with the U.S. to prevent the pact’s collapse by discussing measures that would supplement its conditions. A U.S. withdrawal probably would scrap the agreement, a chief foreign policy achievement for President Barack Obama, by reimposing a broad range of sanctions that isolate Iran from the international financial system. Iran has said it will no longer be bound by the terms of the deal if that happens. 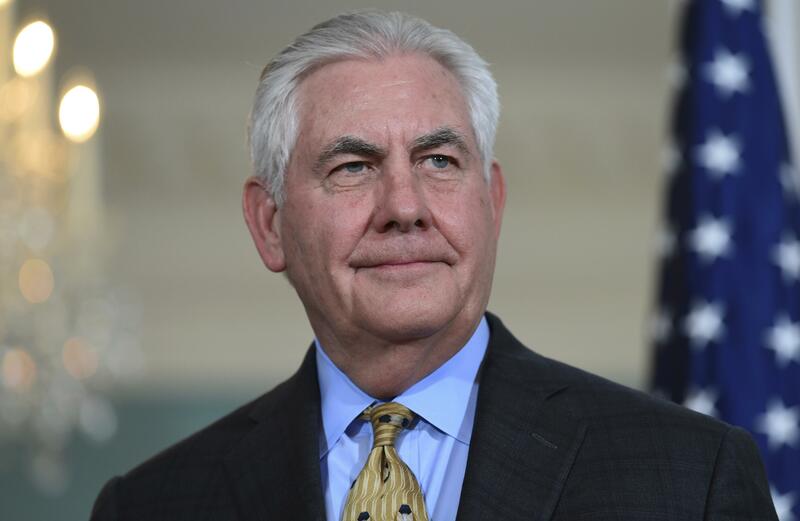 Tillerson, on his eighth trip to Europe since becoming secretary of state a year ago, planned to meet with British Foreign Secretary Boris Johnson and national security adviser Mark Sedwill on Monday. He also intended to visit the new U.S. Embassy in the British capital. Trump had been expected to preside over a formal ribbon-cutting for the embassy next month but canceled plans to visit Britain, citing the billion-dollar cost of the embassy and lambasting the Obama administration for its location in a less desirable area than the old site in London’s posh Mayfair district. That explanation was met by skepticism from many. The decision to move the embassy was made by President George W. Bush’s administration in 2008 after it determined the old facility in Grosvenor Square had uncorrectable security issues. The new embassy was constructed with the proceeds from sales of U.S. government properties and leases in London. The new embassy, in the former industrial area of Nine Elms on the south side of the River Thames, opened its doors on Jan. 16 but is still not 100 percent operational and will not be ready for a grand opening while Tillerson is in London, the official said. From London, Tillerson will travel to Paris for talks on many of the same subjects with French Foreign Minister Jean-Yves Le Drian. He also planned to sign a new international agreement that calls for holding accountable anyone who uses chemical weapons. It’s aimed primarily at Syria. Tillerson was scheduled to join Trump in Zurich and Davos, Switzerland for the World Economic Forum and meetings with world leaders before wrapping up his trip in Poland. But Trump’s budget director says the White House is taking the president’s participation at that meeting, as well as the planned attendance of much of his Cabinet in Davos, “on a day-by day basis” because of the government shutdown. In Warsaw, Trump will reaffirm U.S. commitment to Poland’s security in meetings with the president, prime minister and foreign minister. He also plans to commemorate the 73rd anniversary of the liberation of the Nazi concentration camp at Auschwitz by laying a wreath at the memorial to the Warsaw Ghetto uprising, in which Jews rose up in 1943 against German forces that were to send the ghetto’s last survivors to death camps. Published: Jan. 21, 2018, 9:41 a.m.